The first time I made it, it looked pretty and had a lovely smooth flat dome. This time I overfilled both tins then managed to open the oven too early and so it sunk. Once I had taken it out, spilling out on all sides, I cut the overfills off. Then I ate them. Then I tore another morsel off. And another. Even once they had cooled and I had turned them out, I started nibbling the sides too. This cake is now... rugged. It seems my peckishness overruled any desire for aesthetics. Preheat the oven to 140C (fan). Butter and line a 20cm tin or two sandwich tins. Break chocolate up and put in a medium saucepan with coffee dissolved in 125ml hot water and the butter. Heat until melted. While it's melting mix flour, baking powder, bicarbonate of soda, sugar and cocoa together. Beat the eggs in a separate bowl with the buttermilk. Pour the chocolate mix into the egg mix and beat in. Finally tip the dry ingredients into the wet mix and mix till smooth. Pour into the tin (s) and bake for an hour for one or 40-5 minutes for two - or until a skewer comes out clean and the cake is springy to touch. Leave to cool in the tin then remove to a rack. Split into layers - I've done three from one big tin, or split the sandwich tins - or, as above, just left as two. 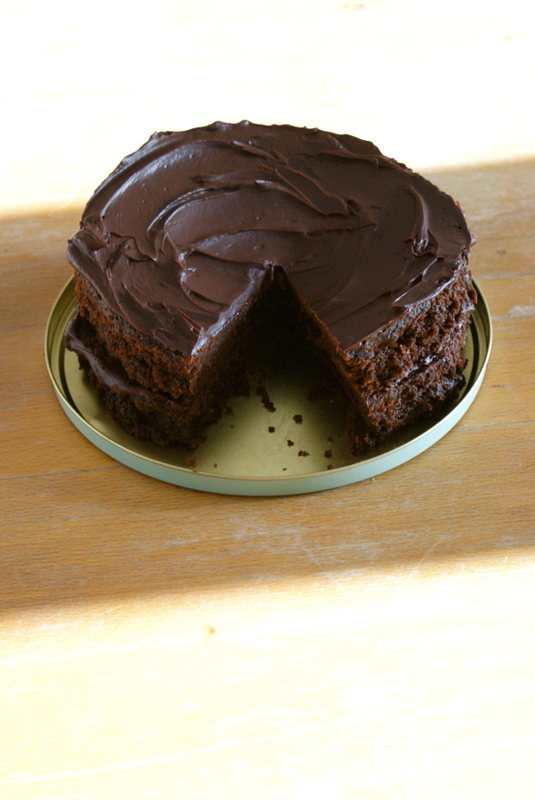 Make up a plain dark chocolate ganache and sandwich together. Either top with more ganache or dust with icing sugar. Looks delicious! 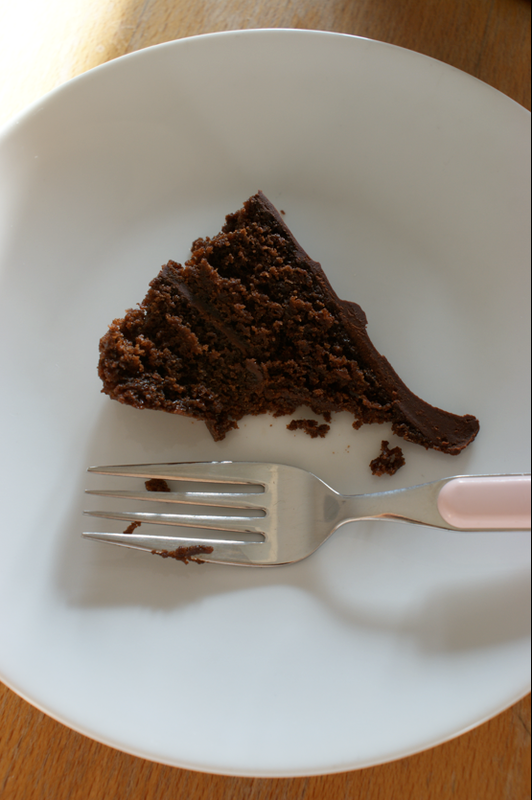 I guess everyone claims to have the ultimate recipe for the perfect chocolate cake, I tried this one. lovely! i think i'll have to try this one for my girlfriend. she's been begging me for days to bake a chocolate cake for her! Ina - that looks lovely, though I can't say I understand the german! Ben - do! It's a great recipe. Anon - so glad you enjoyed it! Hi Emma, thanks for sharing this delicious looking recipe. 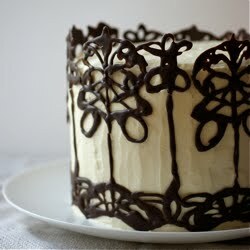 I'd like to make this cake for my little sister's birthday but she doesn't like coffee at all. Is there something else I could substitute in it's place or can I omit the coffee altogether? Thanks for replying Emma. I still haven't yet had the chance to make the cake, as I got sick around the time of my sister's birthday and couldn't make it. However I just rediscovered the webpage and am determined to give it a go! 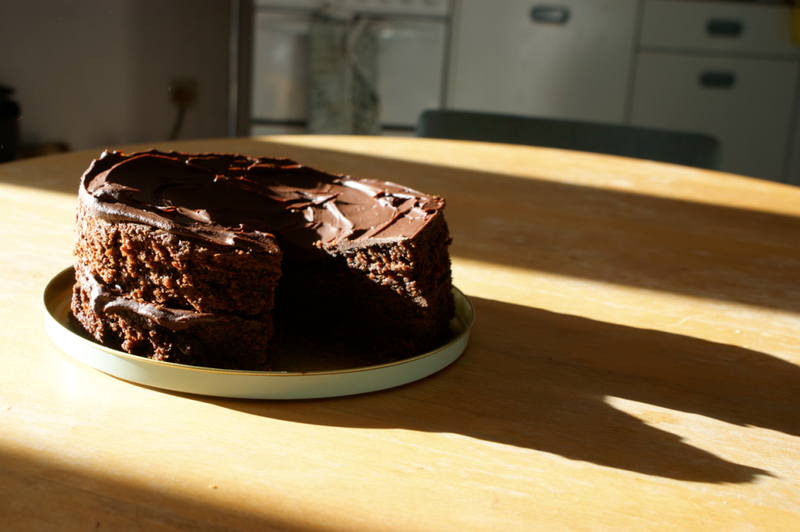 Do you have a ganache recipe that works particularly well with this cake? Hi, thanks for this! I have a few questions! If I cook it in 2 18cm sandwich tins, how long approximately will it need to cook? I also read a few reviews that said it was a bit crumbly and fell to pieces...can this be resolved by adding more flour? Am making it for my boyfriends birthday, so want it to be perfect. I am going to top it with a german buttercreme (vanilla custardy buttercream) topping instead of the ganache, as I dont want it to be overly chocolatey...very excited!!! Also, if I use Lindt Dark Orange Chocolate, will the taste still be good?